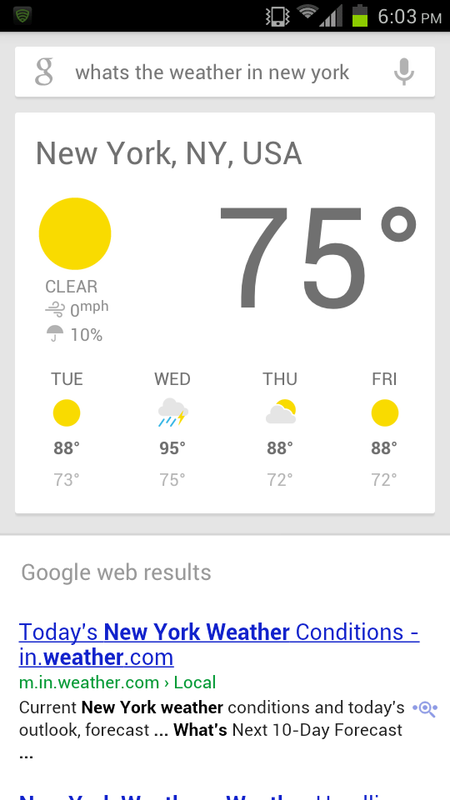 If you’ve been following our recent coverage on the events and highlights of the Google I/O 2012 conference, you no doubt have heard of Google Now. While the location-, time-, and user habits-aware functionality may be eerily reminiscent of SkyNet; the service has the ability to help you be as productive as possible. In my own usage walking around downtown San Francisco after I/O, I found it quite useful. It routinely gave me traffic, weather, and mass-transit information—all based on what it had learned from my habits. Unfortunately, Google Now is not available for everyone. As a core feature of Android 4.1 Jelly Bean, it is not available for previous versions of the OS. However, XDA Recognized Developer febycv has figured out a way around this. By simply modifying the build.prop, users on older versions of Android can enjoy the latest in Google’s privacy intrusions as well. All jokes aside, the service is genuinely useful, and is at least worth a shot. Regarding compatibility, users have thus far reported mixed results. It seems to be incompatible with OEM-skinned ROMs, and some have reported application stability issues after installation. However, febycv suggests that in order to prevent this, the build.prop modifications should be reverted once the application has been installed. If you are looking to get in on the Google Now action on your own AOSP-based ICS device, head over to the original thread. Update: As pointed out by XDA Forum Member dave7802, there is also a modified version of the app available on the forums that doesn’t require editing your build.prop. This can be found in post 142 of this thread.